‘Out… over the hill and then down the dip and through some lumpy bits’. This was how Dominick Tyler used to describe the places he roamed during his childhood in rural Cornwall. Vague generalities were good enough then, but later he felt a more precise, more detailed language must exist, precisely because he needed it to do for millennia: give directions, tell a story or find a place. And so he began collecting words for landscape features, words like jackstraw, zawn, clitter and logan, cowbelly, hum and corrie, spinney, karst and tor. Words that are as varied, rich and poetic as the landscapes they describe. Many of these words for our landscape are falling into obscurity, some endure only by haunting place-names and old maps. 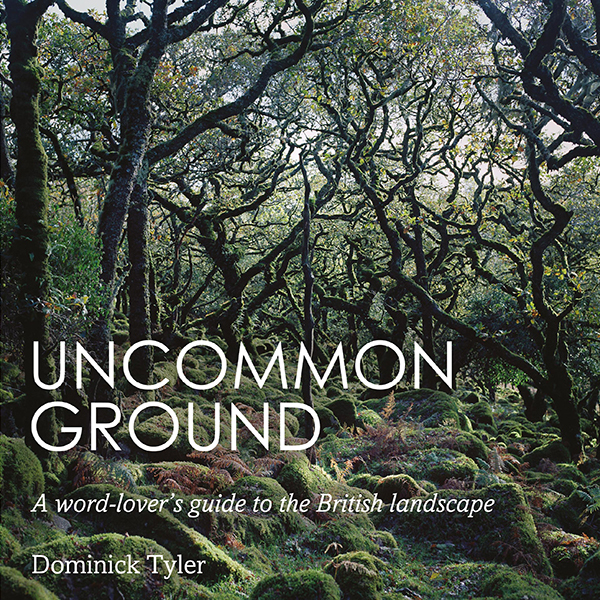 Here Dominick Tyler gathers them into an enchanting visual glossary of the British landscape. On one page are photographs, on the other stories touching on geology, literature, topography, folklore and a time when our ancestors read the lines on the land as fluently as text. Taking us from the waterlogged fens to the white sands of the western isles, this full colour book is a rare delight. Here’s a lovely review of the book by Sue Brooks on Caught by the River. Uncommon Ground is now available from all good bookshops, including Faber&Faber, Waterstones and the guardian bookshop.